I have seen numerous television advertisements in which the makers claim that their product is 'scientifically proven' to perform its function better than other leading brands. Their assumption is that the majority of people will believe their claim to be true because it is supported by scientific evidence. 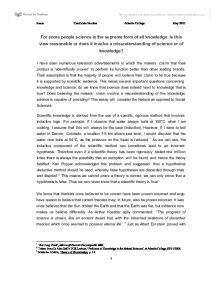 This raises several important questions concerning knowledge and science: do we know that science does indeed lead to knowledge that is true? Does believing the makers' claim involve a misunderstanding of the knowledge science is capable of providing? This essay will consider the Natural as opposed to Social Sciences. Scientific knowledge is derived from the use of a specific, rigorous method that involves inductive logic. For example, if I observe that water always boils at 100"C when I am cooking, I assume that this will always be the case (induction). However, if I were to boil water in Denver, Colorado, a location 1.6 km above sea level, I would discover that the water now boils at 94°C, as the pressure on the liquid is reduced. As we can see, the inductive component of the scientific method can sometimes lead to an incorrect hypothesis. Therefore even if a scientific theory has been rigorously tested one million times there is always the possibility that an exception will be found, and hence the theory falsified. Karl Popper acknowledged this problem and suggested that a hypothetical deductive method should be used, whereby false hypotheses are discarded through trials and disproof. This means we cannot prove a theory is correct; we can only prove that a hypothesis is false. Thus we can never know that a scientific theory is 'true'. We know that theories once believed to be correct have been proven incorrect and ergo have reason to believe that current theories may, in future, also be proven incorrect. It was once believed that the Sun orbited the Earth and that the Earth was fiat, but evidence now makes us believe differently. As Arthur Koestler aptly commented: "The progress of science is strewn, like an ancient desert trail, with the bleached skeletons of discarded theories which once seemed to possess eternal life”. Just as Albert Einstein proved with his theory of relativity that Isaac Newton's laws were incomplete, so in future Einstein's theory may also be shown to be incomplete or even incorrect. To say that science provides us with the supreme form of all knowledge is therefore a misunderstanding of the knowledge it provides: the nature of the scientific method prevents us from ever obtaining knowledge that we know to be absolutely true. A further problem involved with the knowledge obtained by science concerns the scientists themselves. Theories are only added to the body of scientific knowledge when they have been independently verified, and, perhaps even more importantly, accepted by the majority of the scientific community of the time. Scientists are human: emotions, beliefs and prejudices may affect their judgement. These may cause them to either not accept or fail to falsify a theory. Such behaviour is exemplified by Charles Darwin's theory of evolution which, despite ample evidence, was not generally accepted for a considerable amount of time. This was due to the fact that it clashed with the religious and ethical beliefs held by scientists (and society). Thus in some cases, due to the fallibility of scientists, the advancement of scientific knowledge may be halted and false scientific knowledge may be perpetuated. 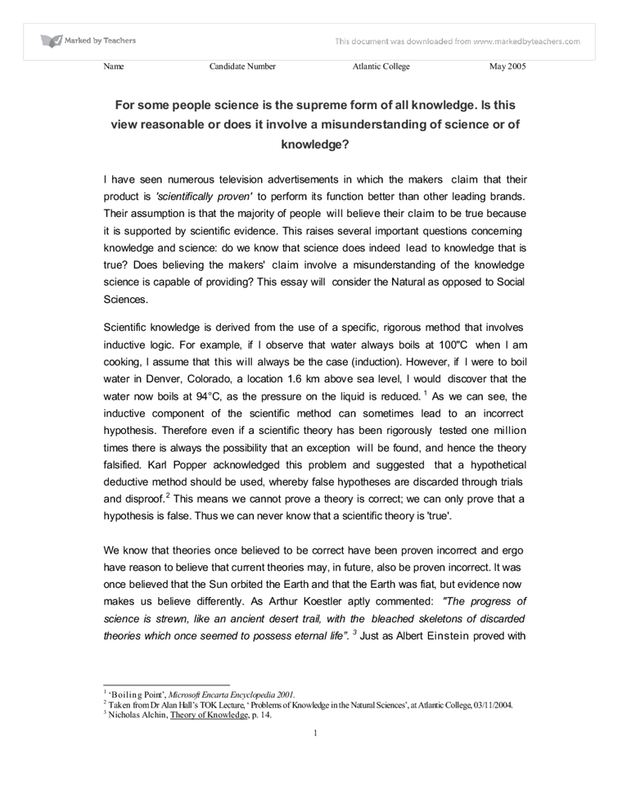 Yet despite these limitations of scientific knowledge, for the most part it can be argued that the knowledge obtained is objective in that, built into the scientific method is the process of scientists constantly attempting to falsify a theory even when it is generally accepted and has been added to the body of scientific knowledge. This healthy scepticism leads to the advancement of scientific knowledge and it is thus believed that we are constantly moving closer to the truth. The proof of this is that new and more sophisticated theories are constantly being evolved to fit a wider range of circumstances. It is reasonable for some people to believe that science is the supreme form of all knowledge. If a person requires a heart transplant in order to live, then the knowledge provided by medical science might be regarded by them, at that time, as the supreme form of all knowledge. But what if the person requiring the heart transplant were a Jehovah's Witness'? Their emotions would lead them to reject scientific knowledge and, instead, put their trust in their religious beliefs. Yet we must also consider that some people may be completely ignorant of all scientific knowledge. NAME OF STUDENT from COUNTRY said that if a member of an isolated African tribe with the same medical condition believed that the knowledge of a witchdoctor could cure them, then they would perceive the supreme form of all knowledge to be that of the witchdoctor. Clearly then, it is not simply a person's circumstances alone, but also their perceptions, emotions and culture, that influence which Area of Knowledge they might regard as supreme. It is therefore equally reasonable for some people not to regard science as the supreme form of all knowledge. The two opposing corners are removed leaving 62 squares. With 31 dominoes shaped such that each domino covers exactly two squares, is it possible to arrange the 31 dominoes so that they cover all 62 squares on the chessboard? Through experimentation and observation the scientist would formulate the theory that it is impossible. However, with millions of different arrangements he could never be absolutely certain that his theory is correct. The mathematician, on the other hand, could conclusively prove that every possible arrangement of dominoes will fail to cover the mutilated chessboard using mathematical deductive logic. Provided this logic and the mathematical axioms (e.g. one domino will always cover two squares) are correct, knowledge derived from mathematics can solve this problem with certainty whereas knowledge obtained from science cannot. Yet it must be noted that logically deducted rules are not always reliable, as they may not take into account every possibility. fn some cases science cannot possibly be the supreme form of all knowledge. For instance, it is impossible to determine which piece of artwork should win the Turner Prize using scientific knowledge. Martin Creed controversially won this award in 2001 with ‘The Lights Going on and Off’. Whilst the judges unanimously believed that his piece deserved to win, much of the general public even questioned whether it was in fact art. When considering a piece of artwork there is no definitive truth as it is subjective knowledge: one's opinion is driven by perception and emotion. The opinion of an individual is thus no less valid than that held by the majority of observers. Scientific knowledge is also irrelevant when considering ethical problems. My TOK presentation described how PGD science now allows us to screen embryos for genetic conditions before selection and implantation into the womb. Subsequent class discussion raised several moral dilemmas, such as: "Is it acceptable to kill embryos that have the potential to yield life? Is the life of a person with a disability any less valuable or fulfilling than that of an able-bodied person?” Scientific knowledge cannot answer the problems of ethics that it has created as it lies outside the realm of ethics. Sometimes, inexplicable events occur which can neither be proved nor disproved using any form of existing knowledge. There are several well-documented examples of statues weeping tears, sometimes of blood. One such example occurred in February 2003 in Bangladesh when tears appeared on a statue of the Virgin Mary. ~ In the absence of evidence of any human involvement our perception tells us that the statue did indeed weep, yet our reason leads us to believe that an inanimate object made of marble could not possibly have done so. A religious believer's emotion may explain the occurrence as a miracle. Yet none of these three conflicting views can be proved to be true or false. Hence we see that no Area of Knowledge can fully explain how the event happened. I low then can it be reasonable to claim that any area of knowledge is supreme? A person who regards science as the supreme form of all knowledge may misunderstand the nature of the knowledge provided by science: the inductive component of the scientific method prevents scientific knowledge from being certainly true, as may the fallibility of scientists. Yet despite science's limitations, the view that science is the supreme form of all knowledge may sometimes indeed be a reasonable one. However, whether one regards science as the supreme form of all knowledge depends on many factors, including circumstance, 'reason’, 'emotion', 'perception' and 'culture'. Depending on the type of knowledge we seek, other areas of knowledge may be superior, or indeed may be our only alternative. This is especially the case when one's subjective, personal opinion is the only Way of Knowing, as is the case in Areas of Knowledge such as the Arts and Ethics. We must further recognize that in some circumstances no Area of Knowledge can give us an adequate understanding. Scientific knowledge is just one of many forms of knowledge. It would be a misunderstanding of knowledge to think that every problem can be solved using just one Area of Knowledge, as the problems we face are so varied in nature. We must use different Ways of Knowing, or a combination of different Ways of Knowing, in order to acquire an understanding. The Guardian, UK, 10/12/2001, viewed on the World Wide Web at <URL: http://www.guardian.co.uk/turnerprize200l/storv/0,7369,616274.00.httnl> Accessed 05/01/2005. From the World Wide Web at <URL: http://www.lnat.ac.uk/word_pdfdocs/SampleTest.doc> Accessed 04/01/2005. From the World Wide Web at <URL: http://news.bbc.co.uk/2/hi/south_asia/2775461 .stm> Accessed 04/01/2005. ‘Boiling Point’, Microsoft Encarta Encyclopedia 2001. Taken from Dr Alan Hall’s TOK Lecture, ‘Problems of Knowledge in the Natural Sciences’, at Atlantic College, 03/11/2004. Nicholas Alchin, Theory of Knowledge, p. 14. ‘Albert Einstein’, Microsoft Encarta Encyclopedia 2001. ‘Obituary for Charles Darwin’, The Times, 21/04/1888, viewed on Microsoft Encarta Encyclopedia 2001. NAME OF STUDENT, a student from COUNTRY in my TOK Class, 08/11/2004. Viewed on the World Wide Web at <URL:http://www1nat.ac.uk/word_pdfdocs/sampleTest.doc (Accessed 04/01/2005). The logical mathematical conclusion to this problem would be as follows: the corners which were removed from the chess board were both white. Therefore, there are now 32 black squares and only 30 white squares; each domino covers two neighbouring squares, and neighbouring squares are always different in colour, i.e., one black and one white. Therefore, no matter how arranged, the first 30 dominoes laid on the board must cover 30 white and 30 black squares. Consequently, this will always leave you with one domino and two black squares remaining; but remember all dominoes cover two neighbouring squares and neighbouring squares are opposite in colour. However, the two squares remaining are the same colour and so they cannot both be covered by the remaining domino. Therefore, covering the board is impossible! Taken from the World Wide Web <URL: http://www.fortunecity.com/emachines/e11/86/chess.html> (Accessed 04/01/2005>. See The Guardian, 10/12/2001, available from the World Wide Web <URL: http://www.guardian.co.uk/turnerprize2001/story/0,7369,616274,00.htm> (Accessed 05/01/2005). Taken from my TOK Oral Presentation at Atlantic College, delivered 10th October 2004. Viewed on World Wide Web at <URL: http://news.bbc.co.uk/2/hi/south_asia/2775461.stm> (Accessed on 05/01/2005). This student written piece of work is one of many that can be found in our International Baccalaureate Theory of Knowledge section. Can a Machine Know? TOK essay. Meaning that the sun will expand many times its original size, but it will also become much colder in the process. This happens because as the original hydrogen which it was created from is being used up, forming heavier elements. * What are human beings capable of knowing? * How can we justify our claims to knowledge? * Are there limits to human knowledge and if there are, what are they? Knowledge is the state or act of knowing or familiarity or understanding gained through experience or study. Since the law-abiding citizen has not committed anything against a legal system, it would appear to be only right for that person to be a first priority. Yes, the convicted felon should be permitted to receive a transplant and medical care, but if a first need basis were present, the law-abiding citizen should be treated first. It seemed that in this place people experience many emotions, which may appear in other environments - this place looked like simulator, a place to get ready for the real life. Jane?s lack of wealth stops her from exploring and finding this home. However, Jane?s persistence and challenge of societies standards allow her to finally find this home. She says to Rochester, "Thank you, Mr. Rochester, for your great kindness. I am strangely glad to get back again to you; and wherever you are is my home, ? my only home." Even today man?s ego gets the better of his rationalism. Being an Indian student I have witnessed a spurt of the incidents of honor killing where the girl was butchered by her own parents only because she married on her own out of paternal accord.